Captain Yesterday is a superhero, and one of the three members of The New Justice Team. 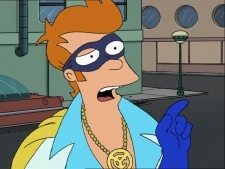 His secret identity is Philip J. Fry. Captain Yesterday’s superpowers include super strength, "lickity-speed", invulnerability, and healing factor. He gained these superpowers from rubbing Dr. FlimFlam's miracle cream on himself. Captain yesterday wears a white and blue jump suit with bell-bottom pants, a golden cape, and a necklace with "C.Y." similar to a 45 record adaptor and a black mask. He has a a 1970s style haircut. Captain Yesterday is relatively calm, particularly compared to Clobberella. He uses his quick speed to make up for his slow mind. Captain Yesterday fought against The Zookeeper and The Son of the Sun. When fighting against The Zookeeper, he used his superpowers to keep him from stealing the Quantum Gemerald. He succeeded in protecting the Gemerald, despite the escape of The Zookeeper. Later, after Morris gave away Clobberella’s secret identity, The Zookeeper kidnapped her parents. Because of this, The New Justice Team was forced to steal the Quantum Gemerald and give it to The Zookeeper so he would let go of her parents. When he fought The Son of the Sun, Captain Yesterday helped him get over his fear of the dark. Captain Yesterday, along with the rest of the New Justice Team, retired mainly due to several factors. These factors include The New Justice Team stealing the Quantum Gemerald and therefore being criminals, and the team running out of miracle cream. He has only occasionally appeared since his retirement. Captain Yesterday's verse in the New Justice Team Theme Song is as follows. The name Captain Yesterday may be a spoof of the Marvel superhero Captain America, who, like Fry, [1ACV01] was frozen. This page was last edited on 15 October 2013, at 22:22.